Preheat the oven to 375 degrees F. Grease a 24-cup mini-muffin pan. In a large bowl, whisk together the flour, baking powder, Italian seasoning, salt and red pepper flakes. Stir in the mozzarella, Parmesan and pepperoni; let stand for 10 minutes. Meanwhile, microwave the pizza sauce until warmed through. 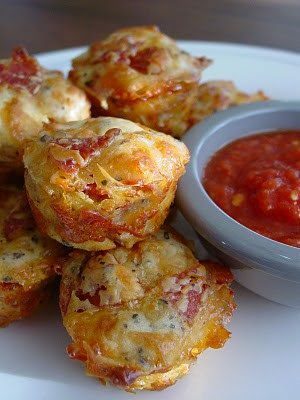 Serve the puffs with the pizza sauce for dipping.